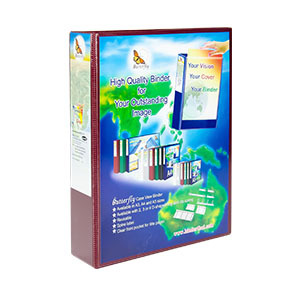 Ring binder, High quality PVC covering cardboard. Water resistance from high frequency sealing technique. Insert personalized cover on front cover and spin. Ring binder with 1 inch rings that hold up to 250 sheets of paper. Ring binder with 1.5 inch rings that hold up to 300 sheets of paper. Ring binder with 2 inch rings that hold up to 500 sheets of paper. Ring binder with 3 inch rings that hold up to 750 sheets of paper.